Gov. Ron DeSantis wants people needing medical marijuana to be able to get it easier and smoke it, and on Thursday he issued an ultimatum to the Florida Legislature: Make it happen quickly, or I will do it without you. “If they’re not able to do it then I will try to bring this to a conclusion,” DeSantis said Thursday in Winter Park, standing alongside attorney John Morgan and U.S. Rep. Matt Gaetz, two vocal proponents for relaxing state and federal marijuana laws. DeSantis gave lawmakers until mid-March to rewrite the state’s medical marijuana law to reflect the intentions of the state constitutional amendment legalizing medical marijuana that 71 percent of Florida voters approved in 2016, known then as Amendment 2. If that doesn’t happen, he intends to drop the state’s appeal of a lawsuit organized by Morgan that would legalize smokable marijuana. The Governor also said he would pull the state out of most of the other 18 lawsuits filed against Florida by medical marijuana advocates, alleging the state failed to implement the amendment properly. “It is my judgment that what the Florida Legislature has done to implement the people’s will has not been done in accordance with what the amendment envisioned,” DeSantis said. “I look at someone who has Lou Gehrig’s disease or terminal cancer or multiple sclerosis … I think the Florida voters who voted for that wanted them to have access to medical marijuana under the supervision of a physician. DeSantis said he will file a “stay of decision” in the case on smokable medical marijuana, now before the 1st District Court of Appeal. 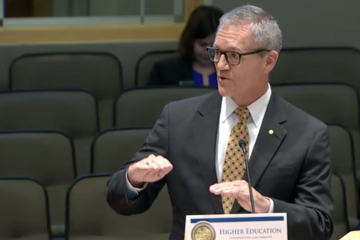 He wants to give lawmakers time for a rewrite of the law — once known as SB 8-A, or the “implementing bill” passed in 2017 — in the Session that begins this March. A request for comment to Fleming Island Republican Rob Bradley, now the Senate Appropriations chairman and then the architect of the implementing bill, is pending. Senate President Bill Galvano, however, soon signaled a willingness to work with DeSantis. “Gov. 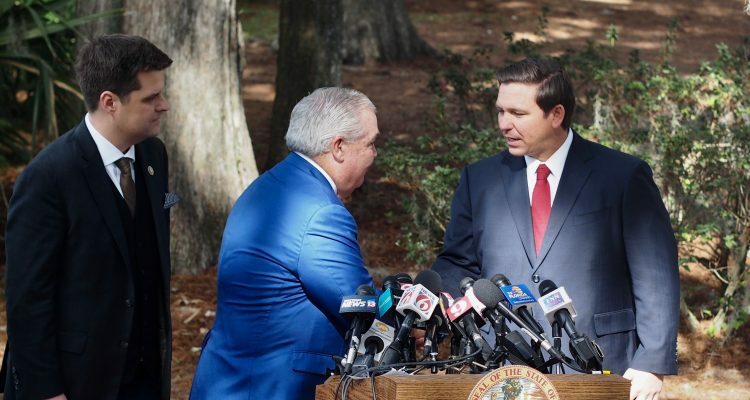 DeSantis has indicated that he prefers a legislative solution rather than a judicial order to bring the issue of implementation of the amendment to a conclusion,” Galvano wrote in a statement on the Governor’s announcement. Later Thursday, state Sen. Gary Farmer, a Lighthouse Point Democrat, was the first lawmaker to file a bill (SB 372) to allow medical marijuana smoking. 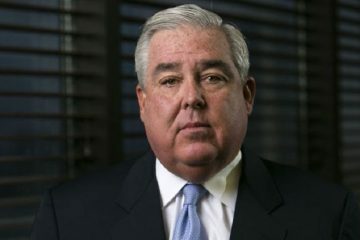 Smokable marijuana was the biggest beef of Morgan’s, the champion for medical marijuana in Florida and the force behind the successful Amendment 2 campaign. DeSantis also decried the licensing program Florida developed for medical marijuana providers, charging that it had created a cartel. On that issue he was joined by Gaetz, who wrote 2014 legislation on medical marijuana when he was in the Florida House. On Thursday, Gaetz disavowed the program his legislation predated. “I am here to suggest that those laws need to change. And under the bold leadership of the DeSantis-Nunez administration, I am certain they will,” Gaetz said, also referring to Lt. Gov. Jeanette Nuñez, who was at the event. Since being sworn in, Oliva added, “the Governor has acted swiftly on many issues and the Florida House will work with equal speed, in conjunction with our Senate colleagues, to bring a bill to the floor early in Session. 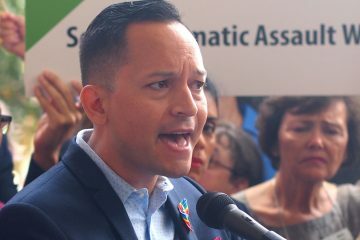 State Rep. Carlos Guillermo Smith, an Orlando Democrat who has been on the front lines fighting to liberalize medical marijuana laws and rules, said Thursday that DeSantis is “right on cannabis” and is pursuing the will of the people. Whether to allow smokable marijuana has been debated since Amendment 2’s passage. State law prohibited the smoking of medicinal cannabis, though Morgan has long insisted the amendment implicitly allows it. Morgan organized the lawsuit over that law, and a judge eventually declared the ban on smoking to be unconstitutional. That prompted the Department of Health under Gov. Rick Scott to appeal the ruling. The 1st District Court of Appeals heard arguments in the case last week. DeSantis is now looking to make the case moot. “I am proud to be here today to thank him today and grateful today for our governor, Ron DeSantis,” Morgan said. He said the program should be opened up, and his and Gaetz’s references to vertical integration suggested he envisions a program in which growers, producers and retailers do not have to be all the same. That could mean, for example, that companies could get licenses to open dispensaries without being involved in cultivating. Gaetz said later that the strict vertical integration was done to control the business model enough so that marijuana stores do not pop up all over the place, has has happened notoriously in Colorado and California. But he said there are other ways to control that activity, and suggested zoning as one. The Governor’s announcement was praised by Agriculture Commissioner Nikki Fried. Fried, the only Democrat to win a statewide contest last November, was an advocate for the drug and pushed to fully implement the 2016 amendment. “When the people overwhelmingly voted for legalized medical marijuana in 2016, they intended for the medicine to be accessible by patients in the manner which their doctor, not Tallahassee politicians, decided is best for their treatment,” Fried said in a statement.